MB Model HT-32" dia. 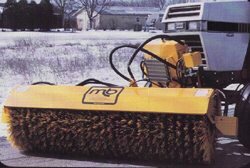 Brush, Includes independent hydraulic system (8ft)Front Mounted Hydraulic Drive Windrow Type Dual motor-32 inch diameter brush Includes independent hydraulic system Mounts to tractor frame. A PTO driven independent hydraulic system is provided as standard. Hydraulic tank and all necessary hoses are included. . Hydraulic valve(s) are electric type, requiring simple installation of switch(es) at the operators position. In most applications, brush on/off is operated by electric valve. In some cases, brush on/off is controlled by tractor PTO. Brush is driven by dual hydraulic motors coupled directly to the core by a splined shaft. 32 inch diameter sectional brush, Hydraulic angle change 30 deg. right and left is standard. WE HAVE THIS AVAILABLE IN STOCK IN 6',7',8'. Estimated shipping weight: 1100 lbs (5 ft), 1150 lbs (6 ft), 1200 lbs (7 ft), 1250 lbs (8 ft).